We live such hectic lives on this journey called life. Be it family responsibilities, job pressures, financial worries and the like, there are so many different potholes along the way that threaten your ability to reach your destination. It’s important to fully grasp that life is much more about the journey then it is about the ultimate destination otherwise things, both big and small, along the way, might derail you. When you graduated from school, did you embark on a J-O-B or a career? Most people do the former, without thinking much about the latter. They get a job, go to work, and then go home. Wash, rinse, repeat becomes the norm and soon days turn into weeks, months and then years. How many of us take the time to stop and reflect on how we truly feel about work? The light bulb went off for me a number of years ago when I saw a quote from Steve Jobs where he said, “passion is the difference between having a job or having a career.” It was the first time of many that I stopped and thought to myself, which do I have? A job is all about financial and material rewards. A career is motivated by accomplishments, success, prestige and power. To take this to the next level, a calling is motivated by the meaning of the work and a sense of purpose. I had built a successful career but did I have passion for the work? In 2010 I had what I now refer to as my ‘face-in-the-mirror’ moment, when I truly stopped to look in the mirror and admitted to my reflection that I had lost the passion I once had for my 30 year human resources career. I knew with certainty that it wasn’t enough; I needed to find and follow my calling. Having diagnosed my own disengagement at work it was now time to figure out how to recalculate what was next. One truly cannot underestimate the impact of disengagement on the world today. With 68.5% of the US workforce self-identifying as disengaged (87% globally) and the cost of lost productivity a staggering $550 billion per year (according to the Gallup Organization), it’s not something we should turn a blind eye to. Disengagement isn’t just a workplace issue; it’s a life issue. We simply can’t compartmentalize our lives. What happens at home affects us at work and vice versa. If you are dealing with things like relationship, childcare or financial issues, when you get ready for work that stress gets dressed with you and heads to the office. At the office, if you are dealing with a problematic boss or other work pressures, that stress comes home with you at the end of the workday. There’s no denying the connection. In my case, when I had my epiphany moment about how disengaged I was at work, I also gained clarity about my relationship with my husband and realized that I truly wasn’t giving 100% to our long term relationship. While we had an extremely strong and loving marriage, I had to admit that I was spending too much time wallowing in my own pity party about how unhappy I was at work and taking time away from us. I’d come home from a bad day and he’d say, “let’s go have a romantic dinner” and I’d say, “can you order Thai food for yourself, I’m not hungry and need alone time.” How selfish can you be? The day I had my ‘face-in-the-mirror moment’ was a life changing one for me. It’s the day I realized that I could do one of three things, now that I admitted out loud that I had lost the passion for the career I built and nurtured for 30 years. I could just simply admit how I felt and go back to my routine. That’s what happens to a large majority of people like me. They need the paycheck and benefits and can’t leave or were just afraid of change. I could talk to my boss (he was a big part of the problem) or HR (wait, I was HR…) about tweaking some things in my job to hopefully make it better. The last and best option for me was to eventually walk toward something better and that meant being thoughtful and strategic as I thought through where my passion did lie and ultimately what my calling was. In the fall of 2011 I took early retirement and embarked on my calling to reengage the world, one person at a time. I became an author, speaker and engagement evangelist and finally felt alive again. My dear husband was right by my side on this part of the life and career journey and was joyful to see my reengagement take hold. We spent so much more time together and laughed every day, something that hadn’t happened in a long time. As I stated earlier in this article, your journey can hit a detour along the way and that happened to me in February of 2015 when my beloved, healthy husband passed away without warning. It rocked me to my core but in the darkness I was able to see the reality that the prior 4 years had been amazing, frankly the best period of our entire relationship. That’s the legacy that emerging from the darkness of disengagement has left me. We all need to cherish the moment and not waste another minute being unhappy and disengaged, both at work and in life. Make a point to stop, look in the mirror and reflect on where you are now and how you are feeling. It’s never too late to recalculate. Remember, it’s not about the destination, just the journey. Ruth K. Ross is a speaker, author and engagement evangelist. After a successful 30-year career as a strategic human resources executive with top FORTUNE 100 companies, Ruth Ross started her own company in San Francisco to focus on the critical intersection where people and process fuse together in organizations. The outpouring of requests from C-suite executives, middle management and service professionals for her thought leadership on engagement validated her belief that disengagement is robbing people of their passions and cutting deeply into corporate profitability. 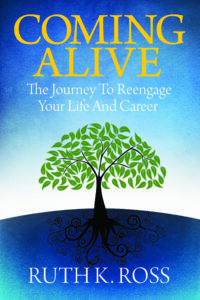 Her recent book, “Coming Alive: The Journey to Reengage Your Life and Career,” explores the epidemic of employee disengagement in Corporate America. Ruth is frequently invited to speak at industry conferences and organizations on this topic. Follow at @ruthkross.